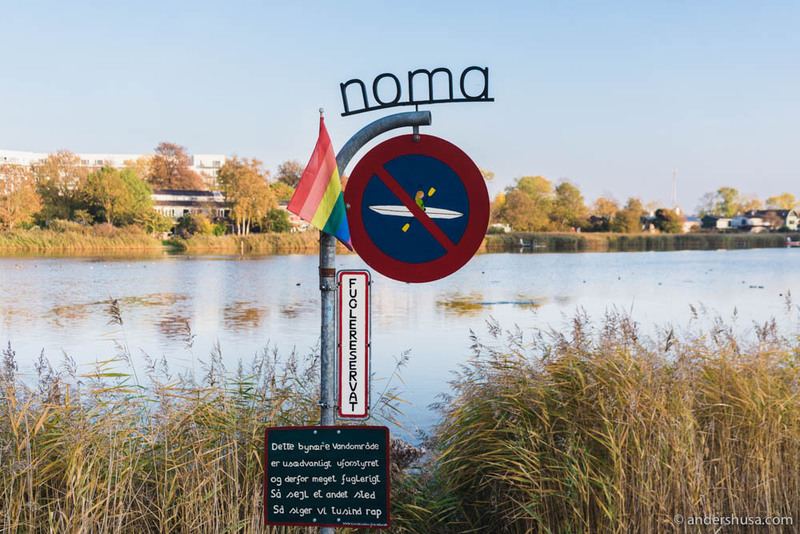 The third and final season of the new Noma 2.0 is, perhaps, the best of them all. I realize those are strong words after having called the vegetable season mind-blowing, and by all means, it’s a close run between the two (with seafood season ending up as the weakest in my opinion). 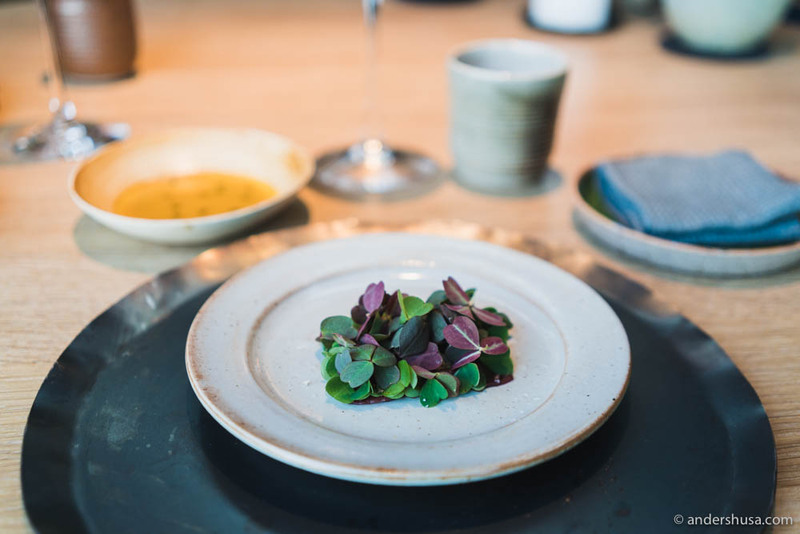 I still think Noma’s take on the plant kingdom was more of a game-changer, but I feel the autumn menu is the most mature, where Noma, finally, has settled into their new style of cuisine. I also love the sustainability aspect, and how they utilize so many different parts of the selected animals. Certainly, the game and forest menu seems to be the most provocative of the three. Especially, if I am to judge from the many angry comments on the video I published a few weeks back (see below). 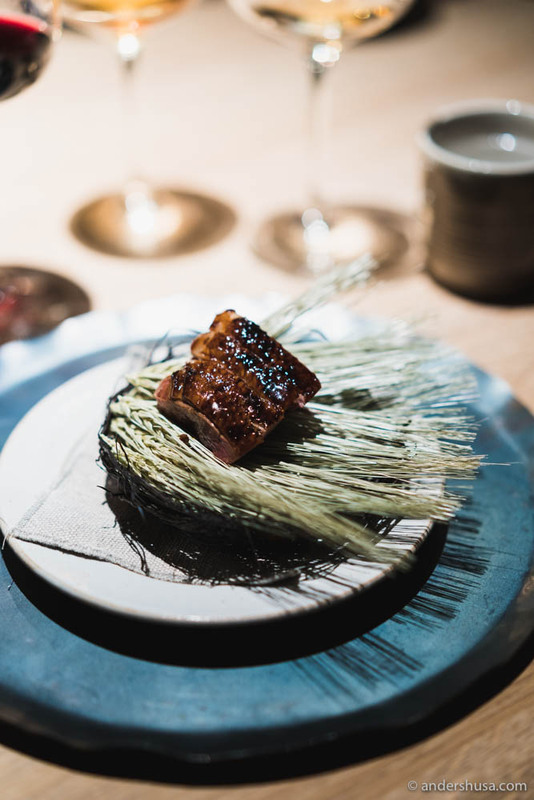 Some people believe that Redzepi and his team has crossed a line and constructed dishes purely for media exposure. I couldn’t disagree more. Instead, I think the intention has been to take a more honest approach to nature and demonstrate which part of the animals we are actually eating. What I love about the new location of Noma is that you can sense the current season the moment you arrive. Both the proximity to nature, as well as the carefully curated garden outside, gives it away immediately. We arrived on time, around 17.00, for our reservation. 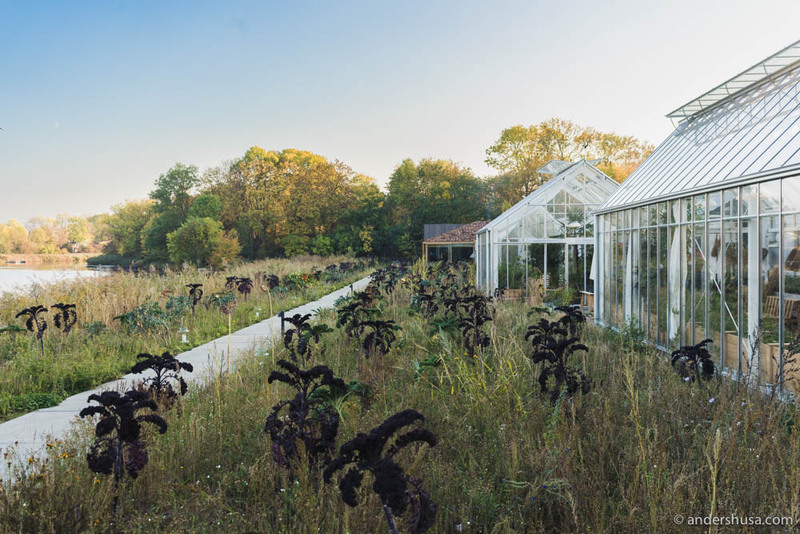 Different types of kale dominated the front yard of the Noma greenhouses. There were already four or five other groups of people waiting at the entrance, and the front of house-manager, Katherine Bont, tried to sort out which tables she should send in first. This is done to make sure that everyone gets the Noma welcome upon entering the building. Plus it gives the service staff time to get each table seated and quickly supplied with water and an apéritif. Since I brought my foodie friend Marianne to this meal, and we’re both the kind of type who wants to try everything, we decided to order one wine and one juice pairing and share them (pro tip for any tasting menu, by the way). 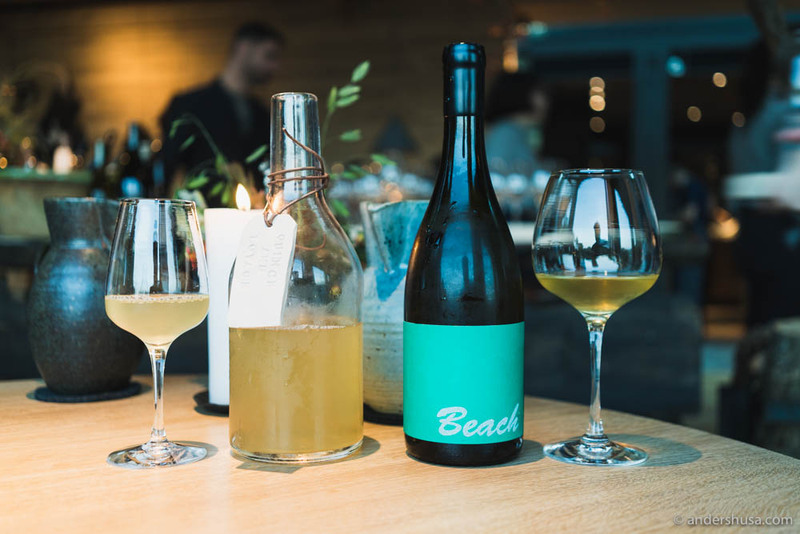 I think Noma’s sommeliers did a great job with the drink selections this season, finding that sweet balance where it’s both delicious and matches the food. 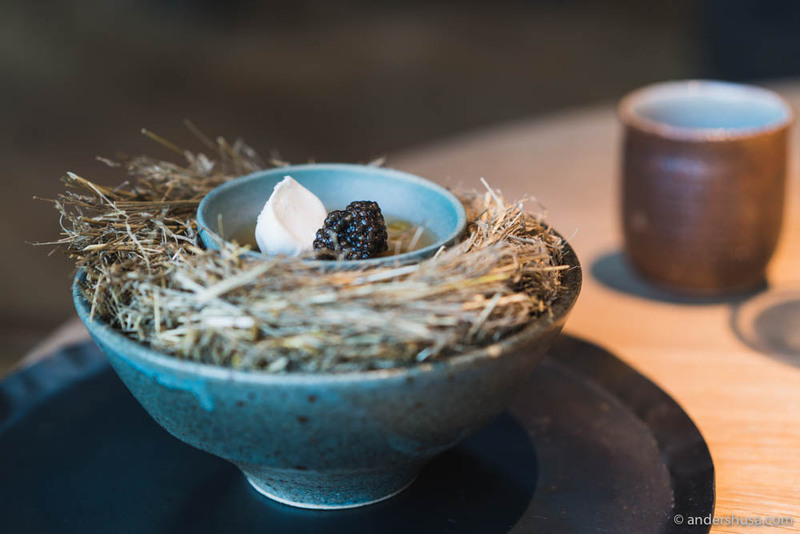 Similar to the previous two seasons (and also in line with a trend in New Nordic restaurants at the moment), the meal began with a warm broth. Already provoking some people, I’m sure, with the use of squirrel garum (a fermented sauce, originally made with fish). 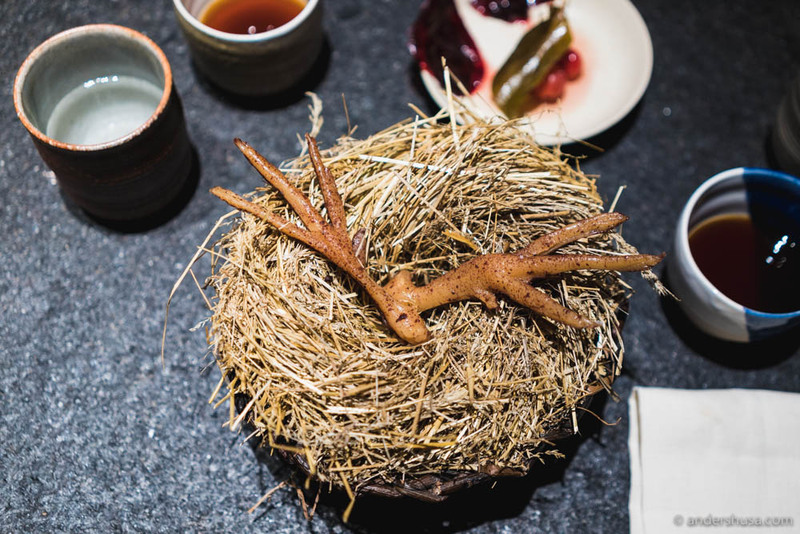 There are two main animals on the game and forest menu of Noma – reindeer and duck. They each get their own little feast, which means a rapid succession of dishes made up from their different parts. Don’t expect any regular cuts of reindeer meat, though. Instead, offals dominate, starting with a tartar made from the heart, which is thinly cut and dressed in wood sorrel. The idea is to pick up a good amount with your hand and dip it into the accompanying egg yolk sauce. 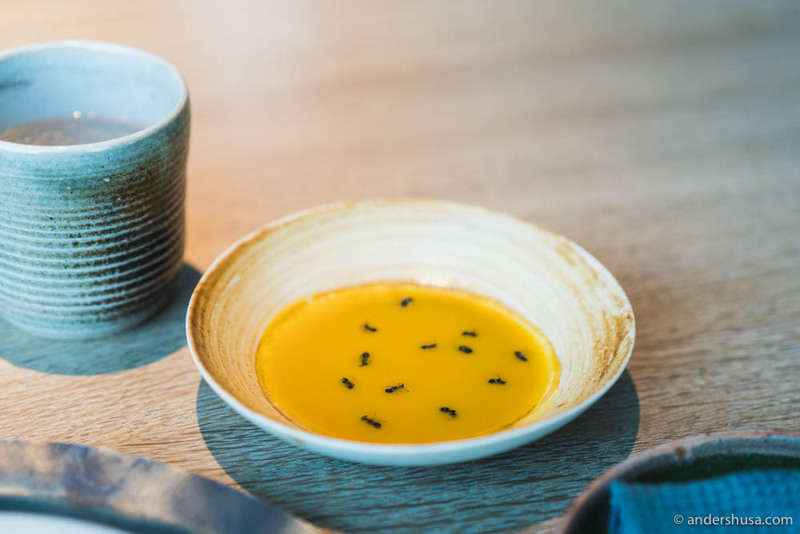 On top are forest ants, which has become a staple for Noma, meant to give acidity. The dish is a bit clumsy to eat – but delicious. 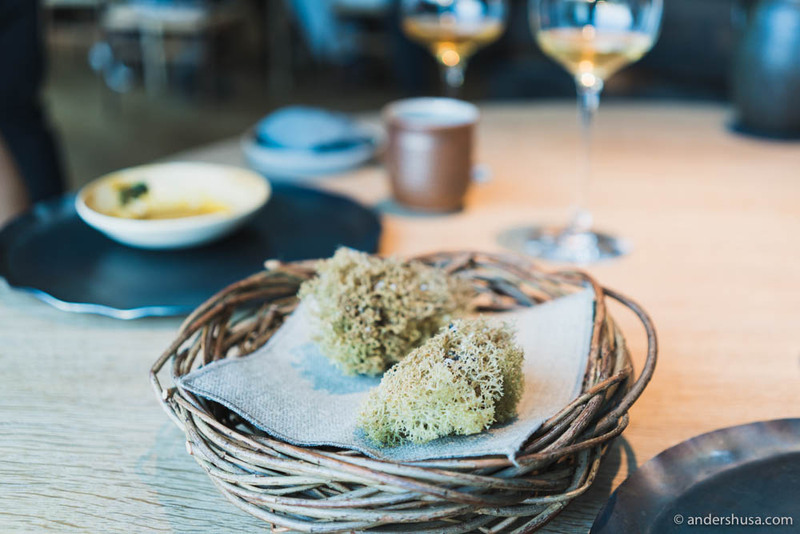 Next up are sweetbreads of reindeer wrapped in reindeer moss – a bushy lichen that serves as pasture for reindeer in Scandinavia. The soft and fatty sweetbread goes well with the crunchiness of the moss, and we are instructed to dip this in the leftovers of the egg yolk sauce (thank goodness I saved some). 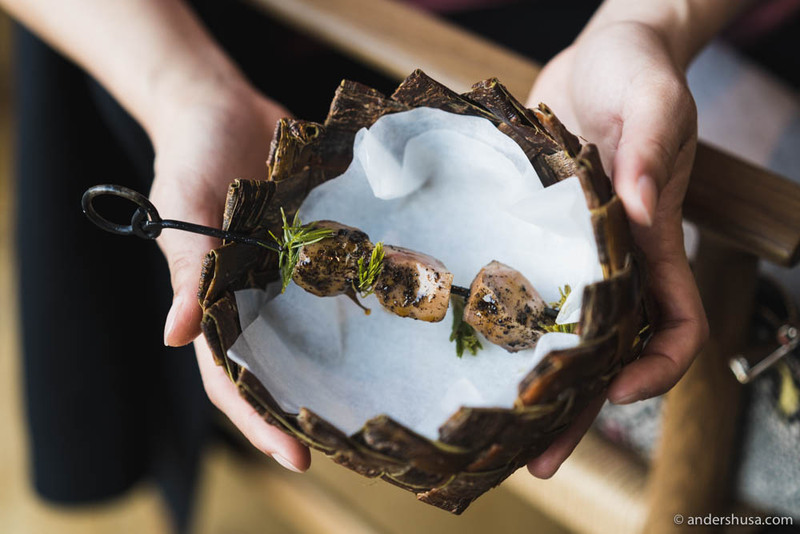 One of my favorite snacks on the game and forest menu is the reindeer tongue, which has been grilled on a skewer together with pine shoots and glazed with a forest spice sauce. The tongue meat has an amazing, fatty texture and the flavors bring back some kind of childhood memory for me, which I, unfortunately, cannot pinpoint more exact. The reindeer feast ends with another highlight. 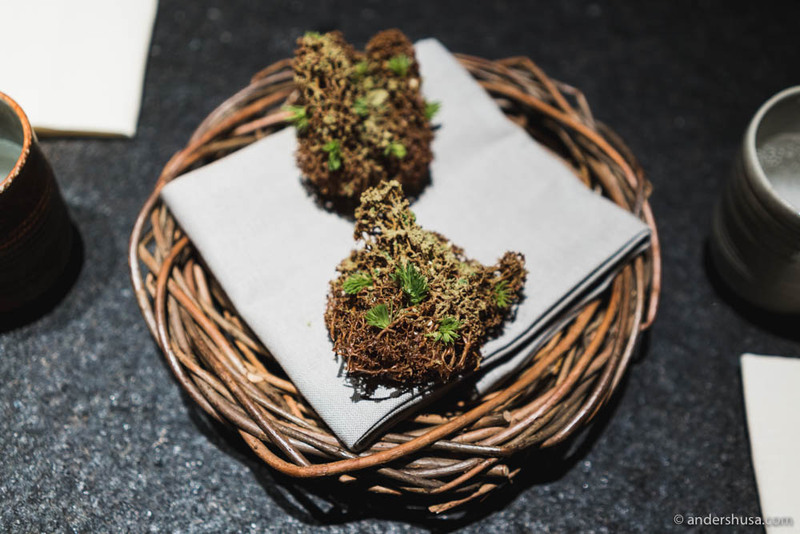 A milk skin pie filled with reindeer brain and black truffle, wrapped in a leaf like a taco. A taco-pie! 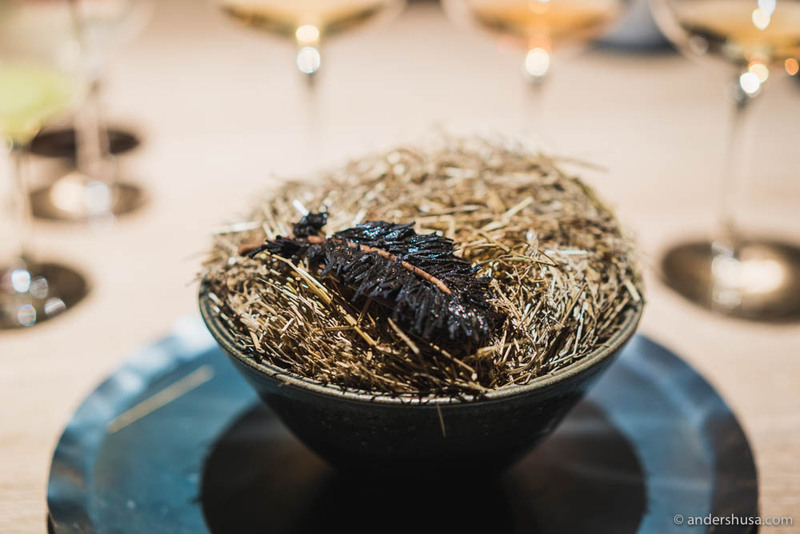 This one reminded me of the milk skin with cheese and truffle from the vegetable menu, and is an example of how Noma continues on an idea from a previous menu, whether it’s from this year, a Noma 1.0 dish, or even one of the pop-ups. Caviar and cream in some variation is another Noma signature, which comes in a brilliant version for the game and forest season. The caviar is from the Danish producer Rossini, so high quality, and served with a dollop of the lightest whipped cream you can imagine (with tiny sprinkles of salt on top, I believe). 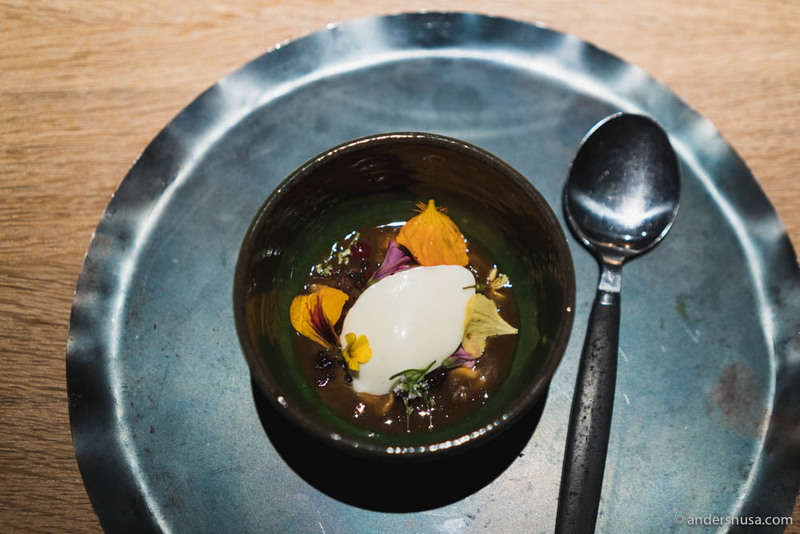 The two ingredients are paired with a cold pheasant broth, which has formed a jelly in the bottom of the bowl. I loved this one! 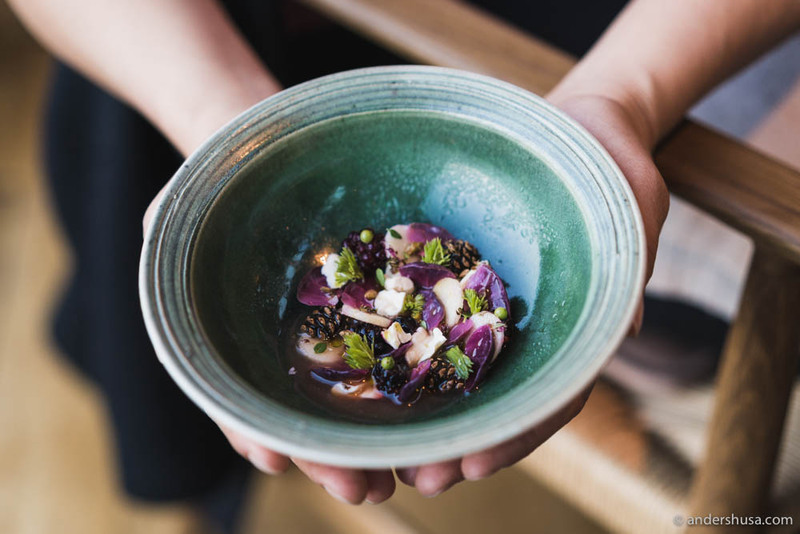 Ceviche of berries has become a modern Noma classic, ever since their pop-up in Mexico last year. Each season – seafood, vegetable, and game and forest – have had its version of this, with the latter being the most delicious, in my opinion. This is also the best use of Noma’s caramelized baby pine cones, which I didn’t understand the use of in the two previous seasons. 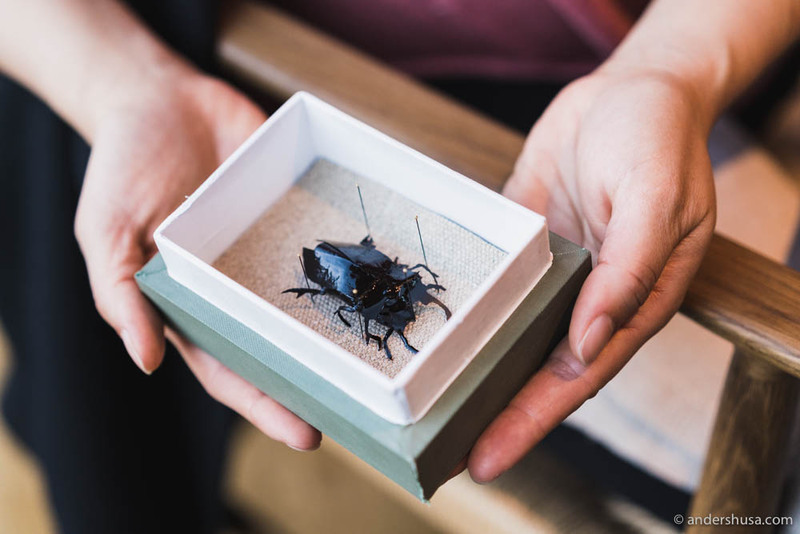 Another dish that provokes people, but mainly because they make false assumptions, is the beetle. 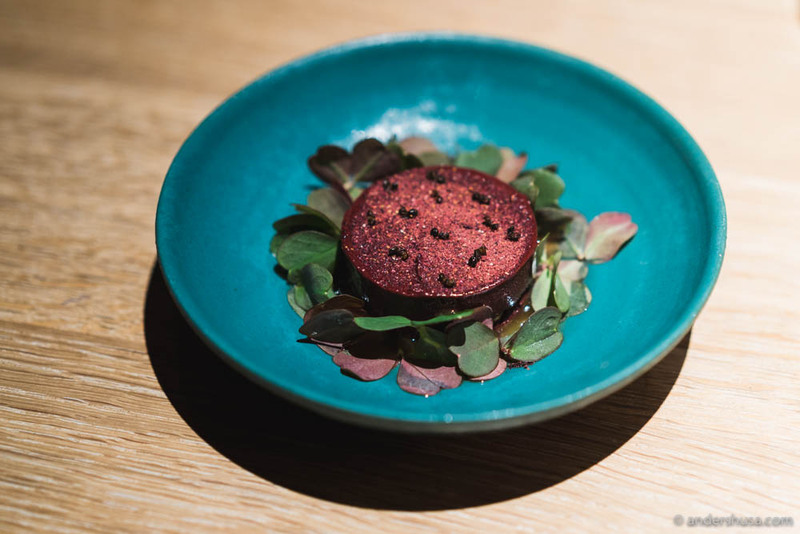 Following the theme of mock dishes, with the jellyfish in the seafood season and the butterfly from the vegetable season, the beetle is actually made up of fruit leather and black garlic. Not so disgusting after all. 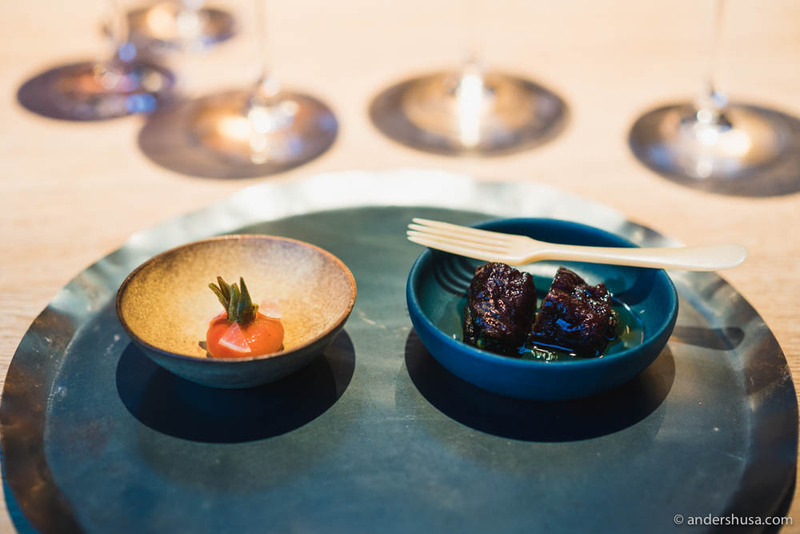 The servings of rose hip with quince, and dried plums with pheasant heart and rhubarb paste, were among the weaker dishes in this menu for me. 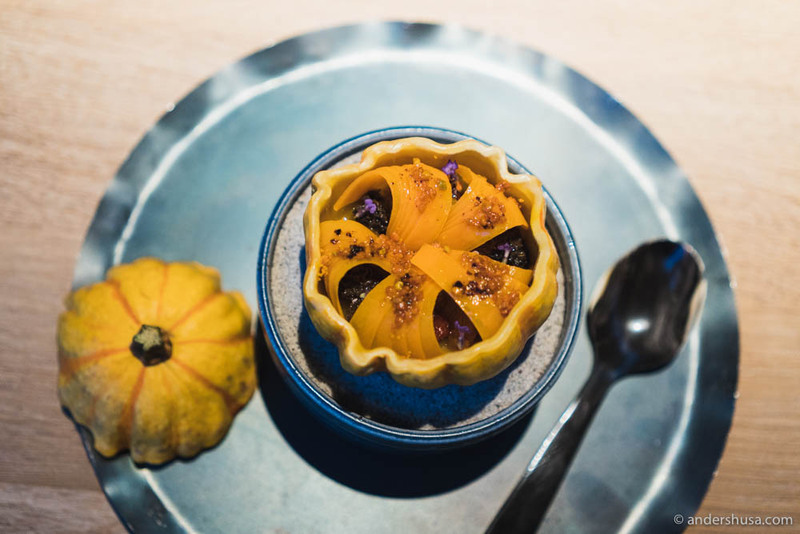 Luckily, we quickly moved on to a delectable pumpkin serving with bee pollen, dried tomatoes, and morels. 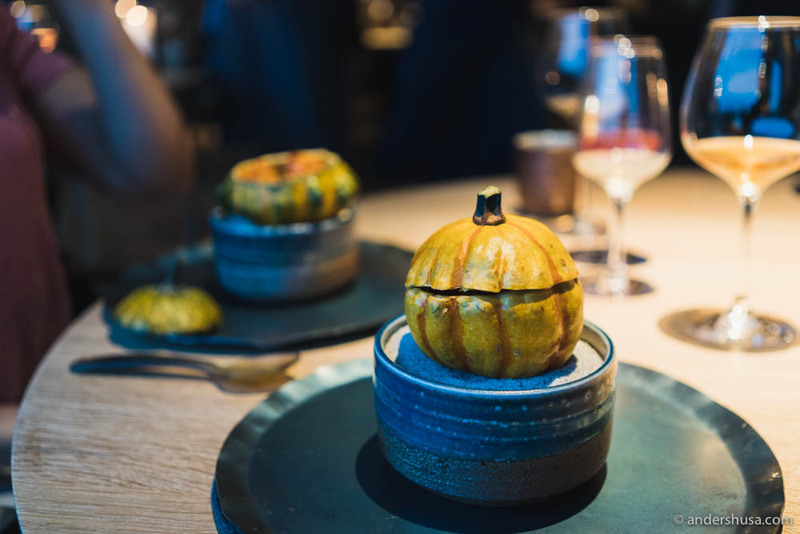 Each season has featured one dish served in a bowl made of beeswax (crafted by the Noma staff) and this was the game and forest version. 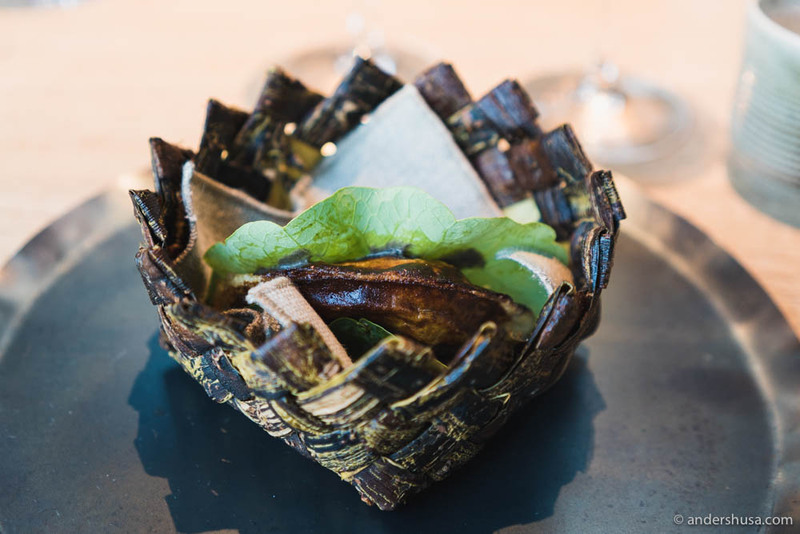 Please, if you go to Noma, try not to break these beautiful, yet fragile bowls. 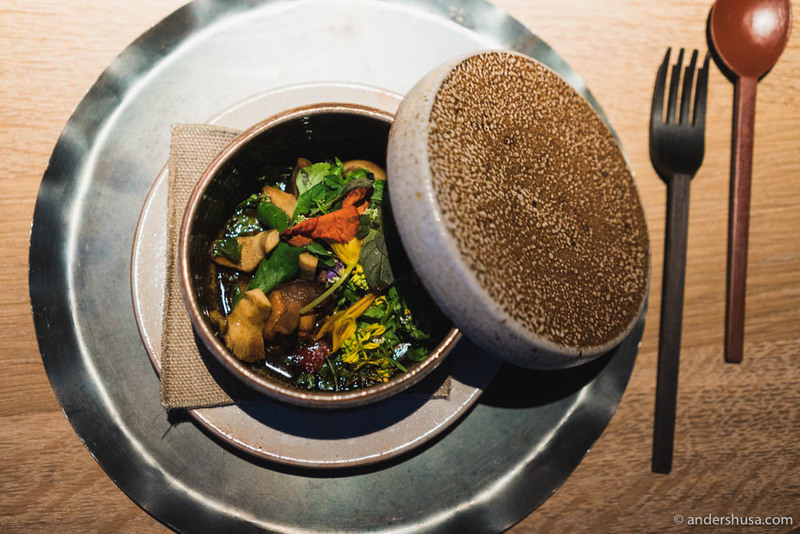 A sizzling hot pot of mushrooms with edible herbs and flowers came to the table with a warning. The bowl is really hot! Not a typical Noma dish, in my eyes, but perhaps inspired by their stay in Mexico. It was a great dish, nonetheless. Not as delicious as the next one, however, a feather made of truffle. After the meal, we got a tour of the kitchen and saw how they made this. Meticulous tweezer work! Mushroom hot pot – sizzling! 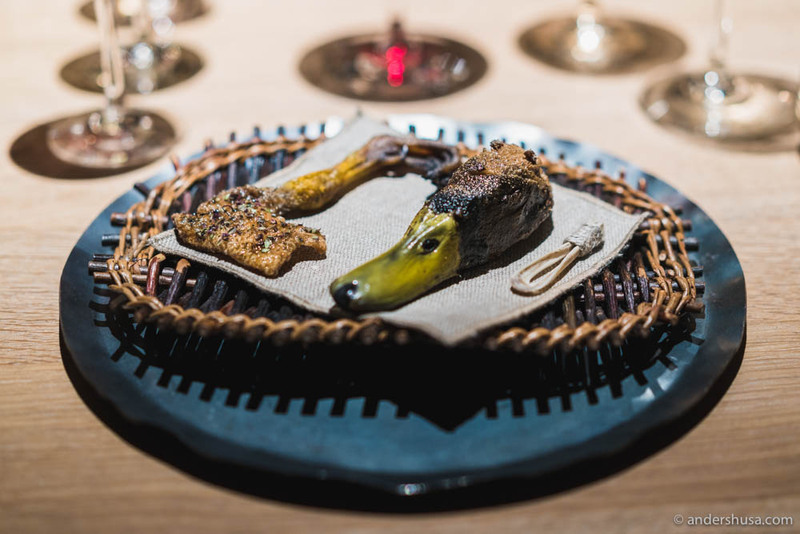 The main attraction of the Noma game and forest menu is the duck feast. A most ordinary serving of wild Mallard duck breast, grilled and glazed with mushroom and quince, kicks it off. The next dish, however, is far from your everyday restaurant plate. In front of you, is placed an entire duck’s head. The top of the skull surgically removed, Hannibal Lecter-style, with the brain still in place. The duck brain, basted in a generous amount of butter and seasoned with something I didn’t catch, is the edible part. A small spoon lies next to it, made from the duck’s tongue bone, which you use to scoop the brain out. If you haven’t eaten brain before, the texture is somewhere in between sweetbread and liver. Super delicious! After you’ve finished, you may actually notice the duck leg chicharron which is also on the plate. Crunchy and fat! 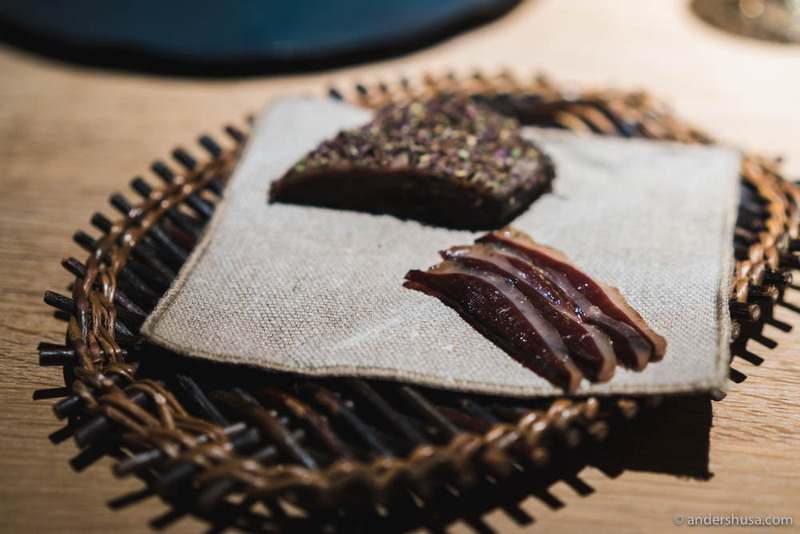 The duck feast continues with some thin slices of cured duck breast. Not the most interesting in terms of flavor, but another way to enjoy the meat. A small carnivore break is offered through a sunflower salad serving which is actually super tasty! 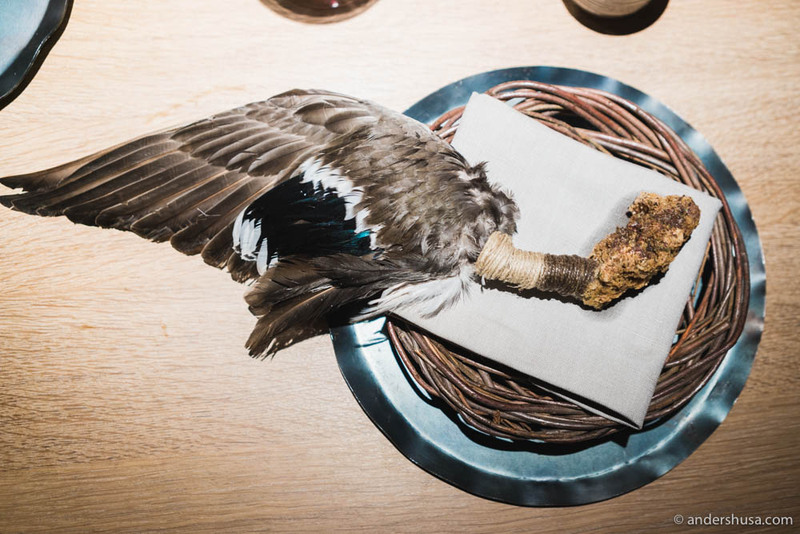 Then, another dish that, surely, will give vegans nightmares – a whole duck wing with the breast meat still attached. Of course, you’re only to eat the meat, which has been given a tempura coating and hot oil bath, but the wing is used as a tool for consumption. Lastly, but definitely worthy of a mention, the duck party ends with a rich ragout of the remaining duck parts, topped with a velvety soft milk curd. Yet another dish that has come in new variations throughout the year (each one brilliant on its own). Once again, I was disappointed by the desserts, which have been the weakest link in all the seasons. Hopefully, this will improve next year, as I think it simply hasn’t been the main focus of the test kitchen. 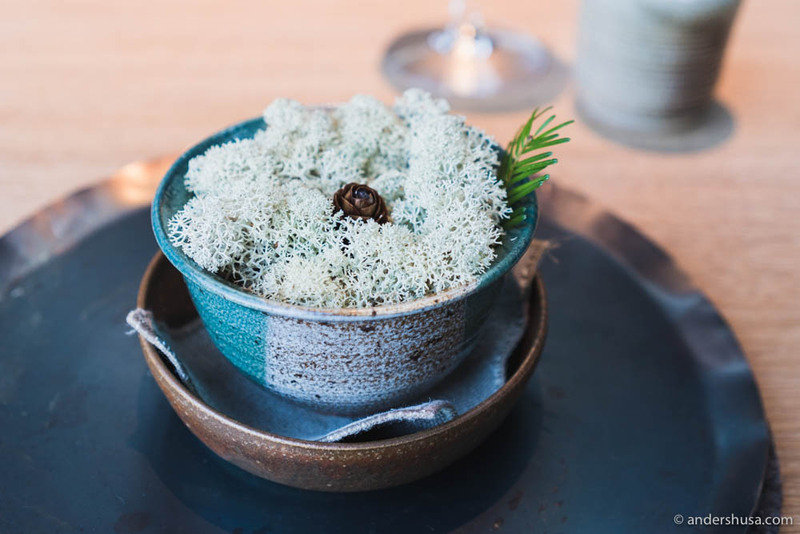 The chocolate-covered reindeer moss is just a revival of an old Noma classic, but fits well with the seasonal theme, of course. 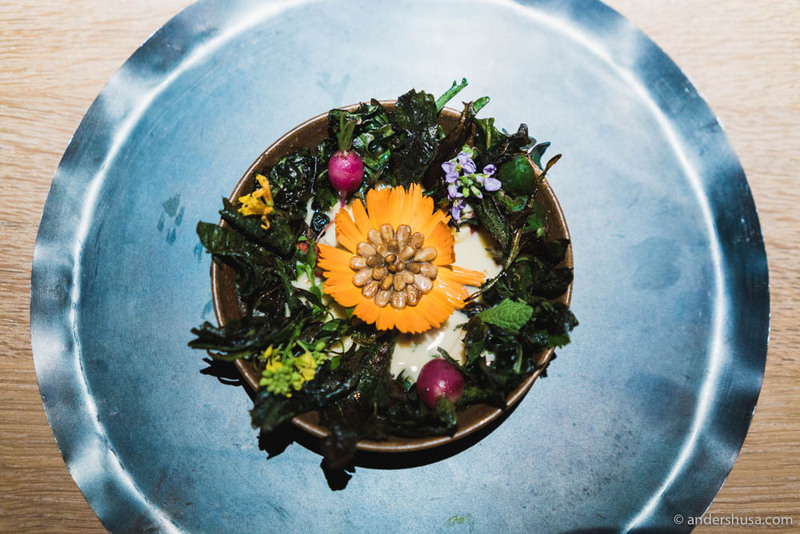 What has been your favorite Noma season this year? I’d love to hear your opinion in a comment below. I agree wholeheartedly that the game season is better than the vegetable season. Still to experience the seafood season but will correct that in January. I think the vegetable season pushed more culinary boundaries and crafted new techniques and flavors. As a cook it was much more provoking than the game season. But the game season was just so well paced and there weren’t as many duds as in the vegetable season. It had this insane poetic flow. 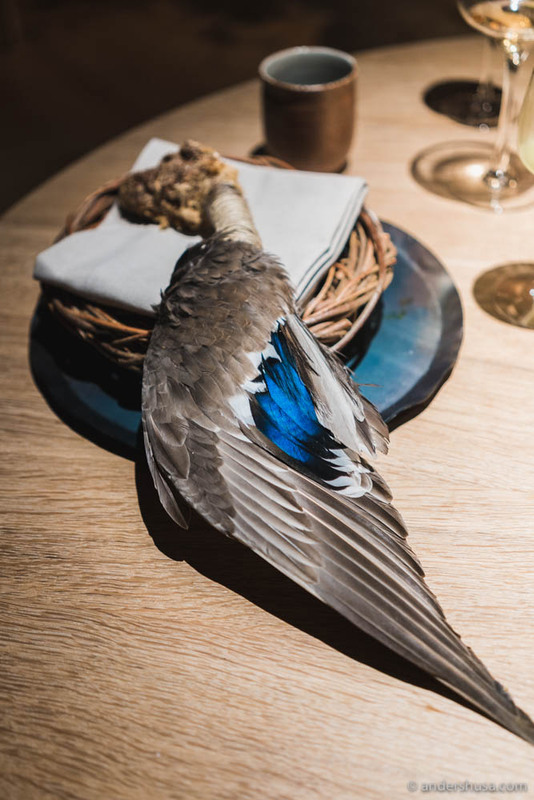 I would recommend the game season for anyone who kind of wants a piece of the old noma and the veggie season (and I presume the seafood) for those who are there for a whole new kind of experience in dining. Looking forward to the seafood season and just heading back to Copenhagen again. Sounds like we agree on the most part!